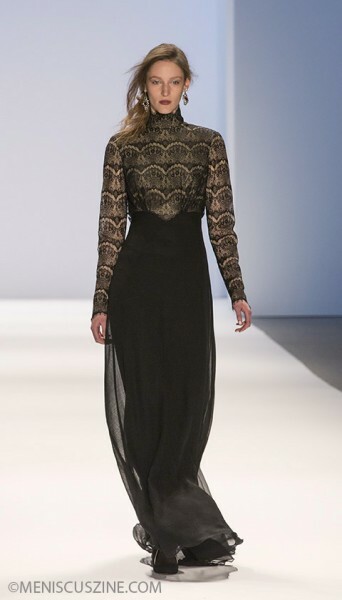 Meniscus Magazine talked to designer Tadashi Shoji after his Russia-themed Fall 2013 runway show in New York. Angela K. Hom: I understand that your theme was Russia and its fall. Why did you decide to go with that theme? 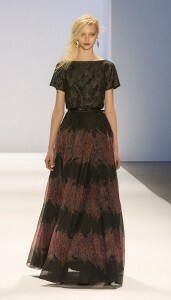 Tadashi Shoji: Why? Because since I was a kid, young, I was reading Dostoyevsky, or Bulgari, and all that stuff. And then, someday I want to go to St. Petersburg. So this time, I went there. And then in the fall, St. Petersburg and then museums, the Hermitage and the Russia Museum, two of them. It so inspired me. And the city itself is so dark, but it [has] beautiful buildings. And then I saw all different movie about the Russian, you know, that area. Followed the movie, and all different. And then, I read all the books and stuff. And then, oh, this is kind of cool. So, this is fun. I don’t know why I did, I can’t explain, but it’s happened, so, yeah. Oh, I know. It’s just beautiful. Do you have a favorite look? Ah, I think everything looks good. I love it. I think caprette is cute accent. So you recently opened two stores in Beijing and Shanghai. Do you find that there are certain styles that Asian women gravitate more towards? Ah, that’s a good one. We do more custom-made stuff over there. So, much more expensive. I think catering for the affluent customer. Interesting. And is there anything that you can tell us to look forward to for next season? We are opening our Beijing show, and fashion show, we’re going to do a big fashion show in Beijing. Then also, we signed our perfume for next year. What are the notes of the perfume? The rose, rosewood. Rose water with cucumber. Scent of cucumber, so it’s very light.